FIELD-TESTING SA’s highly-touted Sharkskin line was a demanding exercise. The line has received much press and much praise, and SA provided me with a sizeable packet on the entire Sharkskin range. I’m opposed to extensive reading before field-testing — it seems to cloud observation — but I did just that when record cold delayed my testing. SA’s marketing materials inform us that the Sharkskin’s surface properties mimic nature, specifically the ability of insects to walk on water. Like an insect’s feet, the tiny diamond shapes on the line’s surface “alter the meniscus force balance” of the floating line. That means improved flotation as well as water shedding and self-cleaning abilities. “The line is no longer both above and below the surface, but sits higher on top,” according to SA product development staffer Jeff Wieringa. The repeating micro-pattern also significantly reduces friction at the line guides contact points, which helps to enhance distance. One additional bonus, courtesy of the micro-pattern, is that the line reflects less light — a concern if you believe “line flash” can spook fish. Much promise in a small package …. In the long run, I think the diamond texture will have its fans and its detractors. Those who like it will tend to be sight-fishermen and anglers who want to have the ultimate in line control. Having a more pronounced tactile feel than a smooth line gives you a better sense of how much line slips through your fingers while false casting, for example. Line control is a critical issue on the water, and this line provides anglers with no less than three (visual, audio and tactile) indicators for tracking it. While I did not cast the line constantly — as many do when blind-casting and “prospecting” — after a few hours of fishing I did sense that those who are casting all day long may have an issue with the line’s abrasiveness. This is easily solved with any sort of finger protection, of course. One other quirk that some might notice: because the diamond pattern reduces surface tension, it is harder to load the rod by picking up a length of line off of the water. 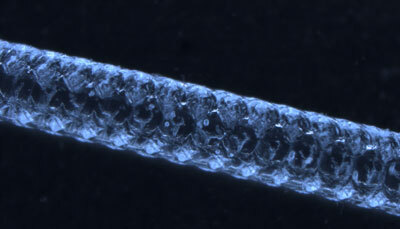 “Water-hauling” like this can reduce the amount of false-casting required and, when performing techniques like certain types of roll casts, can often make the casting easier. Again, if this is a problem, it is probably cured with a slight adjustment in casting style. I’ve fished several SA lines (including this test line’s smooth counterpart) and the found Sharkskin to be slightly stiffer, although this may have been a perceived difference: SA has informed me that both series are built on the same cores. The Sharkskin goes a long way in enhancing the fishing experience by subtly communicating speed and distance as well as adding distance to a cast. 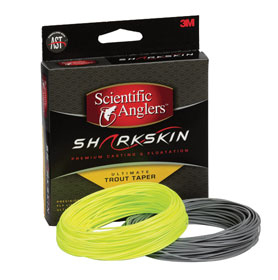 Sharkskin lines are available for a full range of fishing applications. See the 3M/SA Web site for more details.